Moving anywhere from a home you know and feel comfortable in, can be a daunting process. 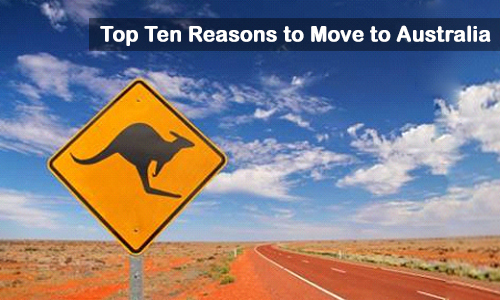 But when considering a move to Australia there are many upsides you might want to take into account before having any second thoughts. If you’ve seen any images of the imposing and sometimes creepy wildlife that can be found in the back woods and outback of the continent, you might have already thought twice, but keep in mind, those pictures are not the normal life of many Australian residents. While it’s incredibly diverse in its ecology as well as biodiversity, Australia is also a very comfortable and engaging place that offers many of its own perks that can be highly beneficial for any interested party. For instance, Australia has one of the lowest air pollution levels in the world. Unlike many other continents, it’s population isn’t so great that it has reached the smog-like levels of the many cities and countries that are deemed as the dirtiest places in the world to live. Australia is still very much a clean and refreshing place to walk around and just take a whiff in, of the fresh, clean atmosphere that awaits. Remember the photos of those supposedly dangerous and even hazardous locations around Australia that are infested by spiders bigger than a person’s hand and snakes that can eat crocodiles? Well keep in mind that while these creepy and sometimes aggressive creatures do happen to inhabit the unspoiled wilds, they are by and large quite content where they’re at and don’t normally wander into the cities and human developments, as they prefer their own homes in the wild unless provoked or otherwise tempted to come forth. The wilds of Australia are a wondrous and even impressive place to visit, offering views unlike any other and a chance to interact with nature that, if done right, can be highly rewarding and even relaxing. One reason why so much nature still exists in its original form is that the continent has a very low population density. There are only six to seven people per square mile in Australia, which, when you really think about it, leaves a lot of open space. This creates a need for individuals to actually interact or grants them the space they desire to simply exist without needing to share their space with unwanted neighbors or guests.